Everywhere you travel in the world you can find Rotarians. Remember there are 35,000+ clubs in the world. If you are in a city where you don't know anybody, consider attending a Rotary club meeting and you will make new friends. If you think about, you will find out that it is a great way to promote peace in the world: making friends in every country you visit. As a Rotarian, I am very concerned in the different ways you can build peace. Sharing with other Rotarians is the first step toward peace. During my recent trip to France, I found a Rotary Club in the center of Toulouse (named the "pink city" because of the color of the brick buildings). They have in fact more than seven rotary clubs in the city. The "Toulouse Cent" Rotary club I visited has thirty members and they meet on the Fridays at noon, in a restaurant on the "boulevard Leclerc". 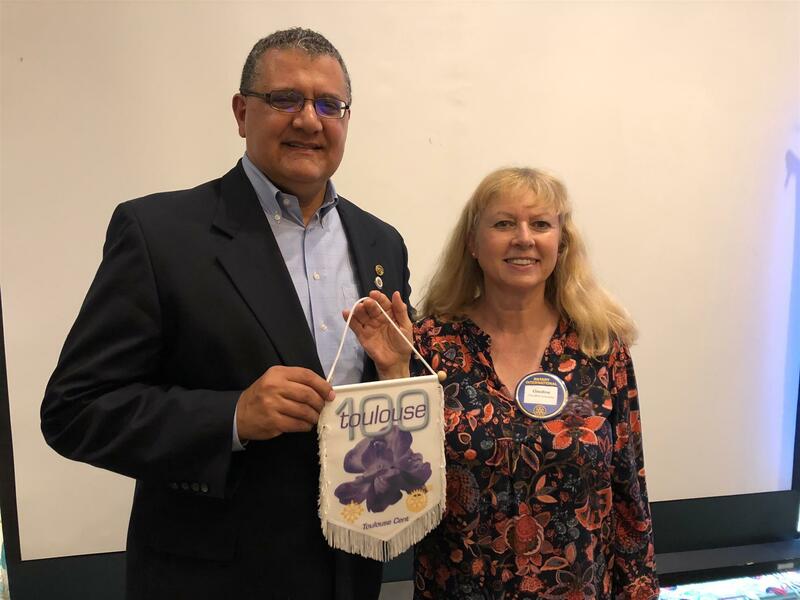 The particularity of the club is that they are all professionals with their own business (doctors, dentists, lawyers, pilots,...), they are in couple (man and wife are both Rotarian) and they are all in their forties. This means I would not qualify to become a member of this club. They were all happy to meet me, and learning that I married an American that I met in Toulouse, made a great impression on them! They explained to me that their club was created when the Rotary celebrated its 100 years, in 2005. 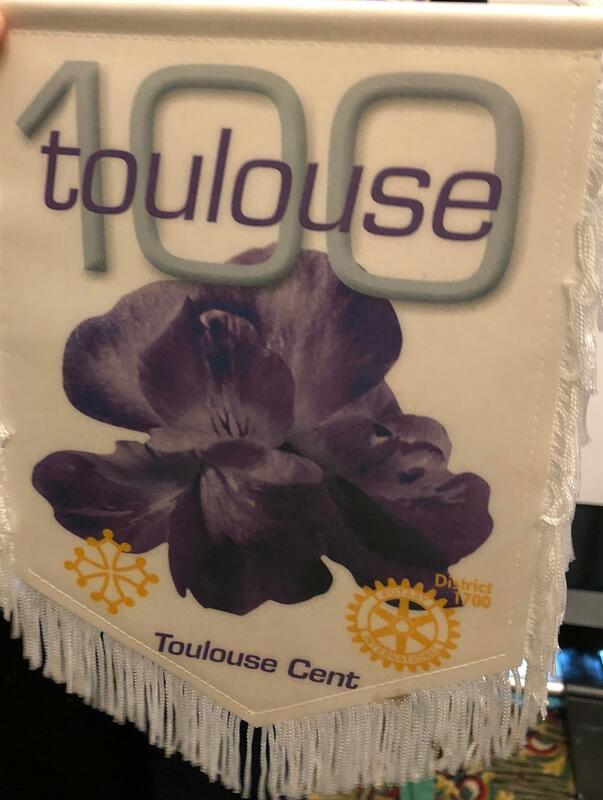 That's the reason why they called the club "Toulouse Cent", in French "cent" means one hundred. They chose the violet to put on their banner as it is the flower of the city of Toulouse. We exchanged banners from our respective clubs. It is very interesting to visit other clubs and see the differences between them. But one thing is certain: Rotarians are good people who work all for the good of humanity. And this make me proud to be a Rotarian!